I thought I knew what a gourmet taco was. Then I tried Knockout tacos, a gourmet taco truck that launched this summer. 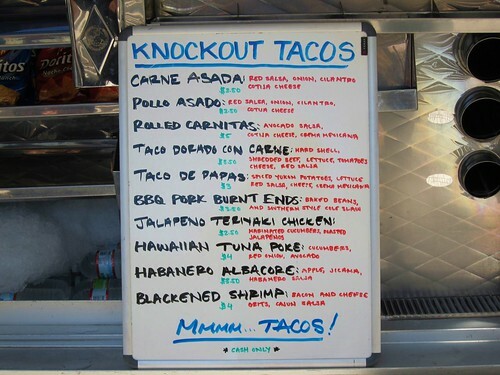 Knockout taco truck is piloted by Chris Goossen, former head Chef at Bottega Louie and El Pearl Cantina. At El Pearl Cantina Goossen had a menu consisting of 42 different tacos! The taco menu at Knockout Taco is paired down to 10 different types of tacos ranging from carne asada to tacos de papa and fish tacos; habanero albacore and Hawaiian Tuna Poke. I ordered the blackened shrimp taco, carne asada, habanero albacore, and bbq burnt ends taco. The blackened shrimp taco is magic. 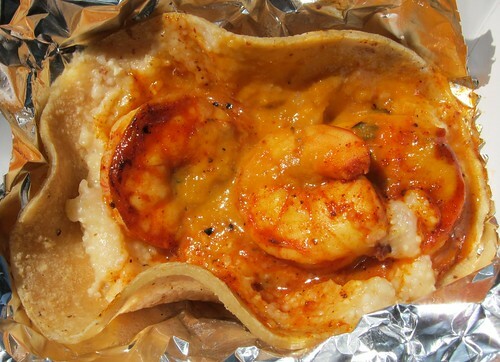 Three plump shrimp on top of a single fresh corn tortilla. Underneath the shrimp is bacon cheese grits and a cajun salsa with strong chile taste (maybe habanero?) that brings both heat and flavor. As I’ve said before, I’m not really a food critic and at times I wonder if my palette is even sophisticated enough to pick up on things your dedicated foodie would recognize but this taco was setting off all kinds of happy things in my mouth. I don’t think you’ll find a more flavorful shrimp taco in LA. After the shrimp taco I opened up the habanero albacore taco. I was pleasantly surprised to find a taco that was cold and stuffed with high quality albacore . The taco was like a refreshing ceviche and the perfect answer to the heat of the blackened shrimp taco. 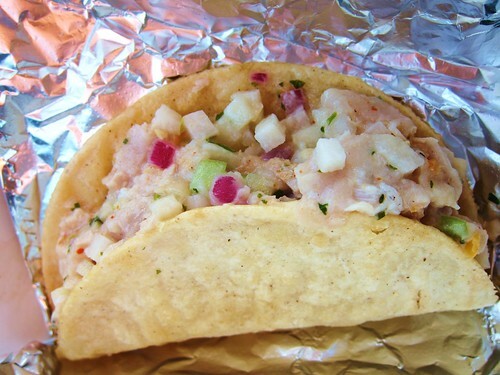 The heat is there in the background but doesn’t take away from the real star of the taco which is the albacore. This is the perfect summer taco. Next up was the BBQ burnt ends taco. After both the seafood tacos it took a couple bites for my palette to adjust to the tangy sweetness of this taco. The pork burnt ends were toothsome and the slaw gave the taco some crunchy texture but the baked beans were the show stealer. These were some excellent baked beans. The burnt ends taco is a reminder that the only rule to tacos is that there are no rules to tacos. Well other than there must be a tortilla to hold the filling together. The flavor is BBQ, the delivery is the taco. 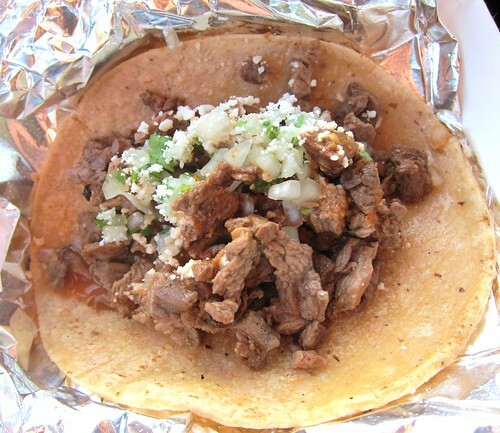 The carne asada taco is topped with onions, cilantro and cotija cheese. The meat is tender, the single corn tortilla very fresh. It’s a good taco but it’s not a great taco. I couldn’t help but think if the carne asada taco had the same salsa from the shrimp taco or another salsa to give it some more bite that it would have been a great taco. 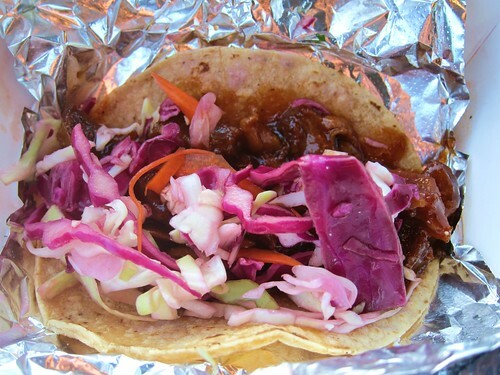 Knockout taco truck is slinging some real gourmet tacos out there. If you haven’t tried the blackened shrimp taco yet don’t let the $4 per price chase you off. This taco is a beauty and worth spoiling yourself for. Follow up the shrimp taco with one of KO’s refreshing seafood tacos ; either the Habanero Albacore or Hawaiian Tuna Poke. The Tuna Poke is next on my list. Knockout Taco has been converted to Machete for the upcoming Robert Rodriquez movie. . Here’s the video. 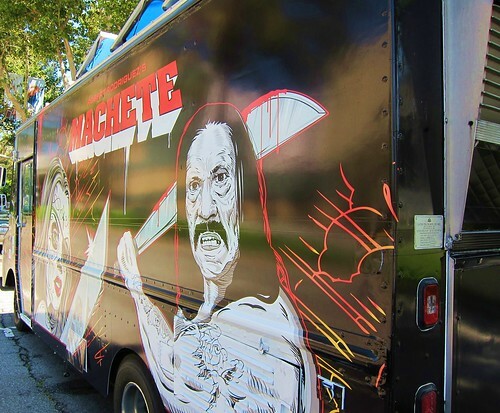 So look for the Machete truck. 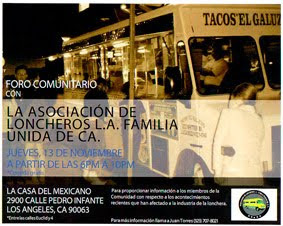 MACHETE Taco Truck Time Lapse Video from SA Studios Global on Vimeo. You need to go back and try the Tuna Poki. That albacore taco is awesome, will have to try the shrimp one as well! After waiting 45 minutes for a table at Bottega Louie the other night, I appreciate this truck even more! i ate at the KO taco truck a couple weeks ago. the bbq burnt ends taco was unbelievably good. go back and get the Dorado and the Pacquiao. trust me.